Testing for and monitoring levels of biocide is an important activity in many industrial and process systems, particularly where the control of microbiological activity is safety critical. Accepta’s range of high-performance biocide test kits allows the quick and accurate in-field analysis of a range of pre-determined oxidising and non-oxidising biocides to improve control procedures and optimise biocide application costs. Our versatile biocide test kits are ideal for engineers, water treatment professionals; and building services and facilities management specialists involved in the application and control of oxidising and/or non-oxidising biocides including bromine, chlorine, chlorine dioxide, isothiazolone, THPS and DBNPA. 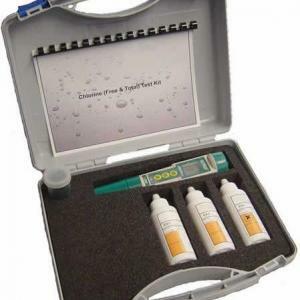 We have put together the most appropriate test kits for our customers with a range of drop test kits and comparator sets dependant on the parameter being tested for.